Ghana have been given the toughest task of the African sides at the 2014 World Cup after being drawn alongside Germany, USA and Portugal in Group G.
Cameroon will face hosts and five-time world champions Brazil in Group A. Ivory Coast have been handed an easier draw than at their two previous finals in Group C.
Nigeria will once again face Argentina in Group F as they did in 2010, while Algeria have highly-fancied Belgium in Group H.
Cameroon have been to seven World Cups but lost all three of their group games in South Africa in 2010. In Brazil next year they open their campaign against a Mexico side that needed a play-off win over New Zealand to reach the finals. Next up will be Croatia before they take on the hosts in their capital Brasilia on 23 June. The Indomitable Lions have been to more World Cups than any other African nation and were the first from the continent to reach the quarter-finals in 1990. However, that is the only time they have progressed beyond the group stages. Ivory Coast will be happier with their draw at their third consecutive finals. This time around they play Japan, Colombia and Greece and they will have high hopes they can progress from the group for the first time. In Germany, they lost to Argentina and the Netherlands before a consolation victory over Serbia and Montenegro. The Elephants managed a draw against Portugal in 2010, but a loss to Brazil meant even a 3-0 win over North Korea was not enough for them to reach the knock-out stages. 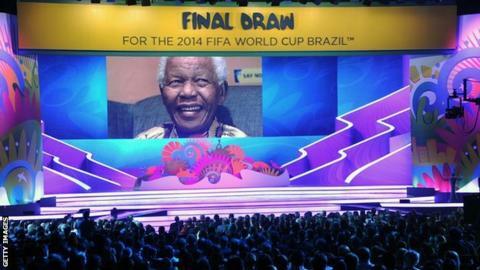 African champions Nigeria will be pleased with their draw at their fifth finals. They face Iran before taking on Bosnia-Hercegovina and will finish against Argentina as they attempt to reach the Last 16, as they did in both 1994 and 1998. They will hope to avoid falling at the first hurdle - a fate they suffered in both 2002 and 2010. Despite losing both their opening group games in South Africa, the Super Eagles still had the chance to reach the Last 16 had they beaten South Korea in their final game but they were held to a 2-2 draw to finish bottom of the pool. The African champions also have the advantage of having experienced the conditions in Brazil before, having taken part in the Confederations Cup earlier this year. Ghana are at their third straight finals and have made it past the group stages on both their previous appearances - but they face some quality opposition in Brazil. The Black Stars will open against the USA on 16 June, before they play Germany and finish against Portugal. At their first ever finals in Germany 2006, Ghana lost 3-0 to Brazil in the Last 16. In South Africa four years later, a missed penalty in the dying minutes of their quarter-final against Uruguay saw them fail to become the first ever African side to reach the last four. Algeria have been given a tricky group and open against a Belgium side that has a vast array of talent. The Desert Foxes then face South Korea and Belgium as they aim to get to the knock-out stages for the first time. They should have advanced in 1982 when they became the first African nation to win two matches at a finals tournament. including a famous victory over West Germany. However, they failed to qualify from the group on goal difference after West Germany and Austria allegedly contrived a result that allowed them both to progress. The match became known as the "Shame of Gijon" and prompted world governing body Fifa to ensure all final group games are played simultaneously. Algeria failed to win a game in their subsequent two finals in Mexico in 1986 and at the last World Cup in 2010.